When Barry Manilow sang 'I Write the Songs' (that make the whole world sing), he was only partly telling the truth. It depends on which songs the world likes to sing. Two of his biggest hits, 'Copacabana' and 'Could It Be Magic' were composed by Manilow but 'Mandy' and 'Can't Smile Without You' - and, misleadingly, 'I Write the Songs' - were penned by others. It matters not. That paragraph above lists five of the most memorable pop singles of all time and they were all either written and performed, or at the very least, made famous by the self-deprecating 68-year-old from Brooklyn. Ever since bursting onto the scene with his 1973 self-titled debut, Manilow has been loved and derided in equal amounts; his straightforward sugary pop romanticism and shiny shirts offering music fans much to adore while at the same time laying himself open to parody from the comedy fraternity. The key to Manilow's continued success has been his ability to shrug and laugh at some of the jokes at his, and his nose's, expense and carry on cracking out the hits. Into the new century and while the just-add-hot-water instant fame of the X Factor culture seems to prevail, the continued success and growth in influence of Radio 2 and eclectic showcases like 'Later with Jools Holland' has contributed to a restored appreciation for songwriters. Consequently, Barry Manilow's stock has never been higher. Tours are greeted with typical fanaticism and albums and retrospectives gobbled up by a hungry legion of 'Fanilows'. The naysayers, if there are any left, seemingly prefer to stay silent these days, most probably in the knowledge that men like Manilow CANNOT BE STOPPED. 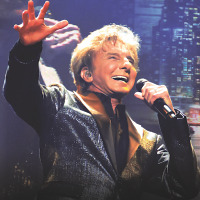 Barry Manilow's UK tour begins at The O2 Arena in London on 15th May, followed by arena dates in Birmingham, Manchester and then Glasgow on 21st May, before the final show of the tour at the Dublin version of the O2 Arena on 23rd May. Tickets, originally slated for general release on 11th November will go on sale Thursday 17th November at 9AM, and you'll be able to get your hands on yours right here!